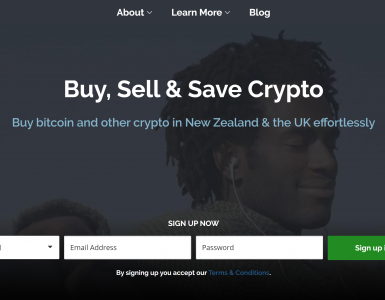 Coincurve– a brand new Vancouver-based company– is a good choice for people who are looking for an easy way to pay for crypto with Flexepin or Interac. 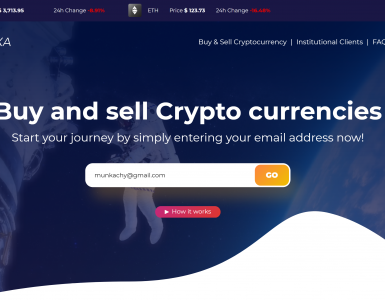 Newbie investors who just want to get in the game and make their first crypto purchase may also want to consider using Coincurve, since it’s interface is very beginner-friendly. A simple wizard walks you through the entire process of buying crypto from start to finish. If any questions arise, a live support team is available to help. The main downside of Coincurve is that its fees are high in comparison to advanced exchanges, which are more complicated to learn but also cheaper to use. Beginner-friendly. The Coincurve website couldn’t be easier to use. All you have to do is type in the amount of CAD you want to spend and then the wizard guides you through the rest of the process. No ID required. Most crypto exchanges require you to upload a picture of an ID card, but all you have to do to buy crypto through Coincurve is provide a phone number. There’s also a voice verification system that takes a recording. No geoblocking. Though Coincurve caters to Canadians with support for Flexepin and Interac, residents of most countries can use the service. However, you do need a Canadian phone number to get through the verification process. Experienced leaders. Coincurve’s two co-founders have founded several businesses and been involved with cryptocurrency since Bitcoin’s inception. Non-custodial service. You don’t have to trust Coincurve with your funds because any cryptos you buy through the site go straight into your personal crypto wallet. Live support. Coincurve is one of the few services that has a live chat feature. Chat support hours are from 9am to 5pm PST. Limited coin selection. The only cryptocoins you can buy through Coincurve are Bitcoin and Bitcoin Cash. High fees. Coincurve’s 5% flat fee is high compared to other crypto exchanges. Limited purchase methods. 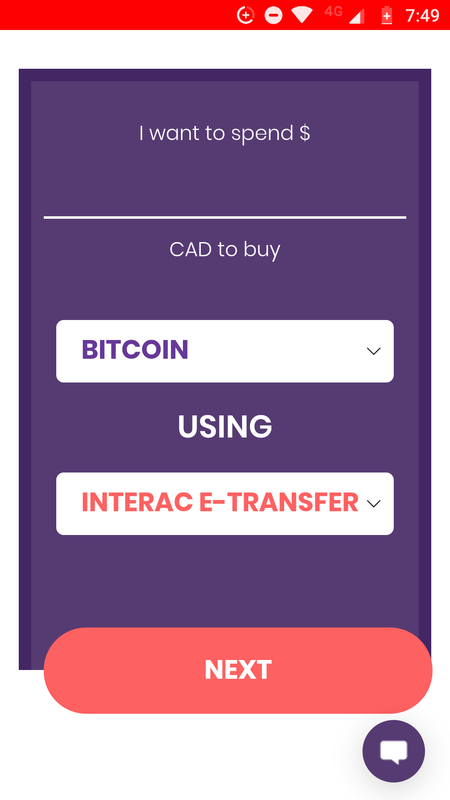 Coincurve’s only purchase options are Flexepin and Interac e-transfers. What Can You Trade on Coincurve? Coincurve is so new that it only recently started to promote itself online. There is no Coincurve blog, and the Coincurve website doesn’t provide much background about the company. Wayne Chen – Co-founder. Chen is a UX/UI expert who’s been involved with numerous startups. Before becoming involved in cryptocurrency in 2013 when he joined nCrypt as Head of Product, Chen was a Lead UI Designer and Producer at Electronic Arts. Rod Hsu – Co-founder. Hsu served as Chief Experience Officer and President of nCrypt. He’s worked at several other Canadian startups, including VMoney, Assembly Block and others. The fact that Coincurve doesn’t store its customers’ funds for them means that it’s not as big of a target for hackers compared to crypto exchanges that do take custody of their customers’ assets. Coincurve only buys crypto for you. Once your purchase is complete, Coincurve deposits your crypto funds straight into your wallet. So far, Coincurve hasn’t been hit by any publicized hacks. As mentioned above, Coincurve is one of only a handful of crypto exchanges that offers live support. You can get help via chat from 9am to 5pm PST. Alternatively, you can file a request for assistance through Coincurve’s self-service ticket system. Because Coincurve just got off the ground, the cryptocurrency community doesn’t seem to be aware of it yet. Nationals or residents of any country included in US embargos or United Nations sanctions can’t use Coincurve’s services. In addition, any nationals or residents of countries sanctioned by Her Majesty’s Treasury can’t use Coincurve, either. Everyone else can. The only thing you need to buy crypto through Coincurve is a valid Canadian phone number. You don’t have to take a photo of an ID card or take a selfie to get through the verification process. Coincurve’s phone verification system collects a voice recording. The only cryptocurrencies you can buy via Coincurve are Bitcoin and Bitcoin Cash. The only government-issued currency that Coincurve supports is Canadian dollars. Coincurve only supports crypto buys. You can buy either Bitcoin Cash or Bitcoin, but you can’t sell your crypto assets back to Coincurve. Coincurve is a beginner-oriented exchange that specializes in ease of use. If you need features like charts, volume-based commission discounts or limit orders, Coincurve is not for you. Coincurve’s trading interface is a simple wizard that walks you through the process of buying Bitcoin. The first step involves typing in the amount of CAD you want to spend. The minimum and maximum amount of crypto you can buy is $20. The maximum limit is $500. If you want to buy more than that, you can initiate another transaction. Next, copy and paste your wallet address. If you don’t have a crypto wallet yet, you can set up a free one by following the link to blockchain.com. A warning message advises to triple check to make sure that you’ve pasted in the correct address. 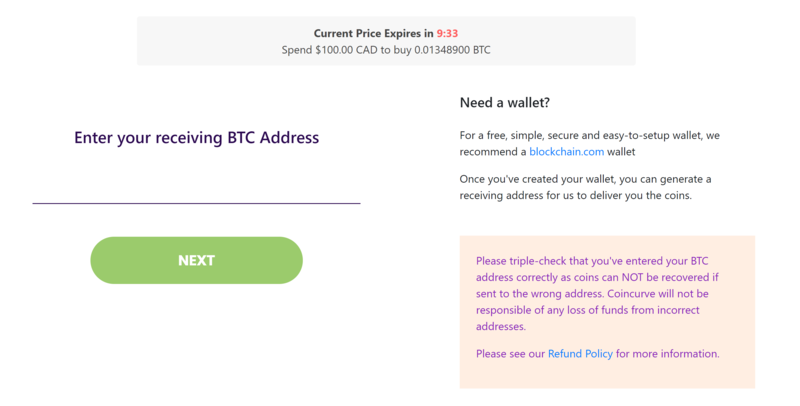 Your deposit will fail if you try to send Bitcoin funds to a Bitcoin Cash wallet or Bitcoin Cash funds to a Bitcoin wallet. 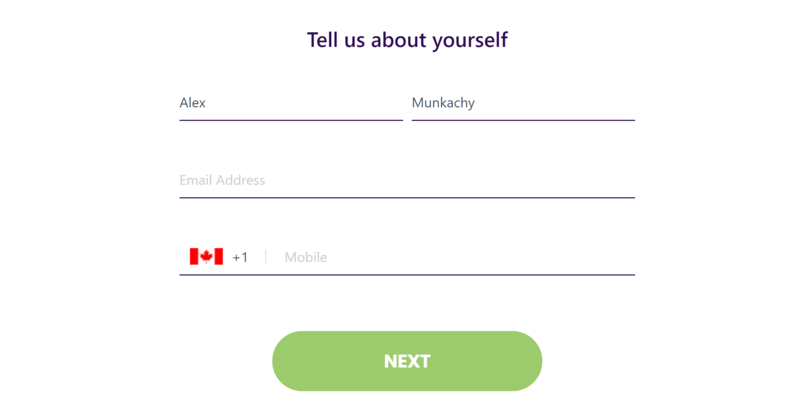 Now, provide your name, email address and a valid Canadian phone number. The last steps of the wizard are straightforward. Once you choose a payment method and confirm the transaction, Coincurve will take care of the rest and send your crypto funds to your wallet. All Coincurve transactions incur a 5% fee. In addition, Coincurve charges a small fee to cover the cost of mining. Currently, that fee is 0.0004 BTC / 0.0002 BCH. Coincurve’s key differentiator is its hassle-free verification process. Most other Canadian crypto exchanges require you to submit a picture ID and a selfie before you can place a trade. If you use an exchange that doesn’t have automated verification, registering can take anywhere from a few hours to several days. But with Coincurve, all you need is a Canadian phone number. However, the convenience of Coincurve’s quick and easy crypto purchases has a cost. Coincurve’s flat 5% fee is high compared to exchanges that cater to professional traders. Advanced crypto exchanges are not as quick and easy as Coincurve, but they are much cheaper to use. If all you want to do is take a long position on Bitcoin or Bitcoin Cash, Coincurve may be right for you. The 5% fee won’t matter much if you only want to buy a few hundred dollars’ worth of cryptos. However, if you plan to invest $1000 or more, it may be worth it to learn how to buy crypto through an advanced exchange. Coincurve’s current strategy seems to be focused on recruiting new crypto investors. 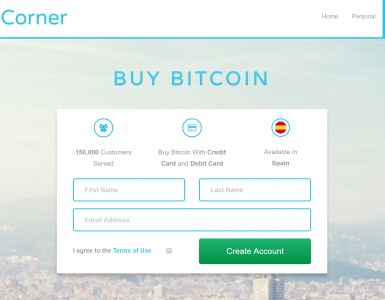 All of its core features are designed to make the process of buying Bitcoin and Bitcoin Cash easier for newbies.